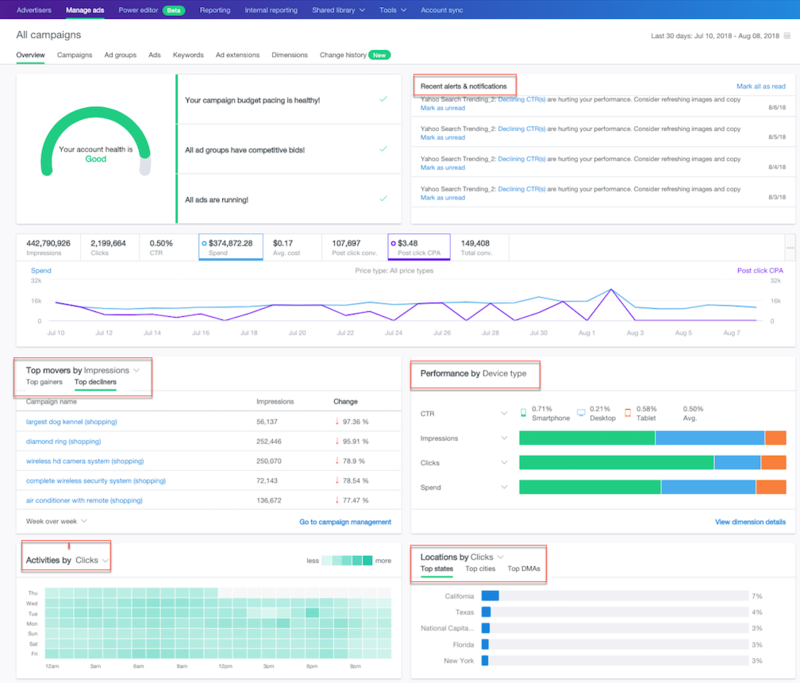 Native & Search now provides advertisers with a new Account Overview feature, a set of reporting metrics and charts that enables you to surface everyday native optimization tasks in a few clicks, and to discover performance insights at a glance. That means, you’ll gain actionable insights that lead to greater scale, return on investment (ROI) and improved campaign performance. For information on how you can identify competitive opportunities to increase supply group bids for your CPC campaigns, see Use Supply Group Insights to Optimize Supply Group Modifiers. Troubleshoot performance across bids, budgets and ads. 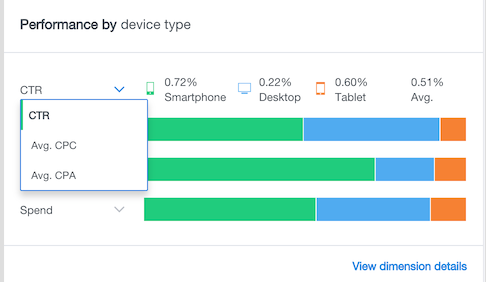 View quick snapshots of your campaign top movers, device performance, account dayparting and account location performance insights. Find rejected ads with a single click, ensuring that you stay on top of creatives that need alterations in order to serve successfully. To access the Account Overview cards, navigate to Manage ads > All campaigns > Overview. The account health score indicates how many native opportunities are available to address on a given day. Good Green indicates that less than 30% of campaigns have overpacing budgets, less than 30% of ad groups have non-competitive bids and less than 30% of active ads have an editorially rejected status. Moderate Orange indicates that 30% to 70% of campaigns have overpacing budgets, or 30-70% of ad groups have non-competitive bids and finally 30% to 70% of active ads are in an editorially rejected status. Poor Red status is defined as more than 70% of campaigns, ad groups or ads have opportunities for improvement. 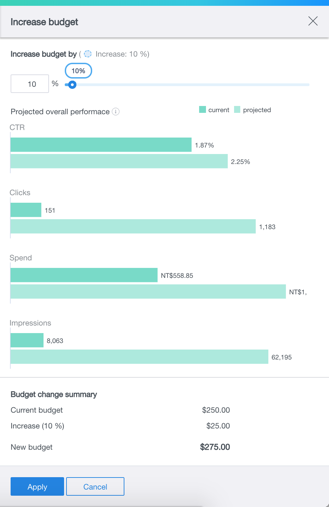 For a graphical view of your campaign performance, including Impressions, Clicks, CTR, Post-click CPA, Avg. cost, Post-click conversions, Post-click CPA and Total conversions, click the KPI bar. To highlight campaigns that are hitting their budget caps and any ad groups that have non-competitive bids, you can access new bid and budget opportunities via the Account Health card on the Overview tab. Budget opportunities are surfaced for campaigns that are hitting budget caps or being restricted by their budgets. Click the Account Health card link for a filtered view of the campaigns tab and an icon that links to the Budget Opportunity Drawer. In the Budget Opportunity Drawer, you can toggle the budget value up and down to forecast performance changes. Overpacing is defined as a campaign that has been hitting its budget cap regularly over the past 7 days. The forecast provided in the budget opportunities drawer assumes a fixed bid and CTR values, indicating a 7-day impact of any budget change. The data is directional and highly dependent on auction dynamics. Low Bid opportunities flag ad groups whose bids (assuming a fixed CTR value), make their eCPM less competitive in a bid landscape model than they could be. In the filtered view of the ad group, navigate to the icon next to the low bid alert column. Click that icon to see a right bid drawer that shows the Max Click bid recommendation, as well as a step-value slider and a graph with directional KPIs that might be achieved at various bid levels. 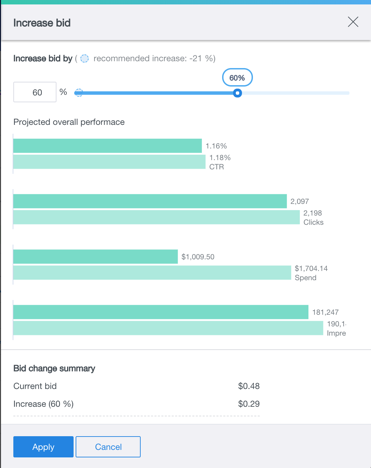 In the UI, you’ll see the MAXIMUM clicks value on the bid landscape curve, above which additional bid increases will yield diminishing scale opportunities. For a filtered view of the ads in the account that are tagged with editorial rejection flags, click the Account Health button. The Alerts card highlights HIGH priority alerts over the last 14 days and includes opportunities, like ads with declining CTR, or billing and funding issues that can be addressed. To view a device dimensions breakout in the campaign tab, click the link at the bottom right corner of the card. Click the CTR dropdown to view the Average CPC and Average CPA. The Activities card lets you analyze account-level hourly trends by displaying a heatmap, with a range from less to more activities by clicks. The Activities tab card is based on the account time zone. Click the Clicks dropdown to view Post-impression conversions, impressions, Spend and Post-click conversions for your campaigns. The Location card enables you to visualize KPIs at the State, City and DMA levels to help with location targeting when planning your campaigns.